The graded double-toothed roller crusher is a new concept of graded crusher developed by our company on the basis of imported similar product technology. 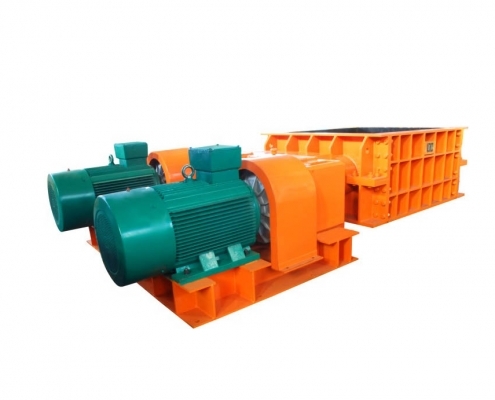 It is completely different from the traditional roller crusher by crushing and crushing materials, but using The combination of shearing and stretching achieves the breaking of the material. The graded double-toothed roller crusher is equipped with two horizontally mounted and parallel toothed rollers in the crushing chamber. The surface of the toothed roller has broken teeth. The toothed rollers are rotated by the transmission device (single motor drive or double motor drive), and finally the crushed teeth The force of shearing and stretching is applied to the material to break it. When a larger crushing ratio is required, an adjustable crushing bar can be installed under the two rollers of the stepped double-toothed roller crusher. When the toothed roller holds the material, the first stage is broken, and when the material passes through the double roll, the first stage is generated. In the second stage of the crushing, the crushing rod can cooperate with the roller teeth to perform the third stage crushing on the fragments generated in the previous two stages. After years of development, the graded double-toothed roller crusher produced by our company has formed five series and various specifications. With its excellent function, it can efficiently crush all kinds of wet, dry, sticky, soft and hard ore and rock without blocking. In terms of structure, performance, quality and service life, it has reached the international advanced level of similar models and can completely replace imported products. It has been widely used in the crushing of various ores such as bauxite, limestone, laterite nickel, raw coal and oil shale. 1. The breakthrough of the classification double-toothed roller crusher in the theory of crushing makes it more compact and lighter than other crushing equipment of the same output, which reduces the investment cost. 2. The graded double-toothed roller crusher is completely different from the traditional double-toothed roller crusher. It uses the tensile force and the shearing force to break the ore, thereby reducing the powder content and the product granularity is relatively uniform. 3. The graded double-toothed roller crusher has a large tooth shape, and the design of the position and spacing of the broken teeth ensures that those particles smaller than the acceptable block degree can pass through the crushing section without breaking, so that the crushing power consumed is reduced. This unique Its characteristics make it have high processing capacity at low speed and low wear. 4. When dealing with large water content and thicker materials, a sparse plate can be arranged on both sides of the crushing roller to clean the teeth to avoid sticking. 5. The hydraulic coupling and the hardened surface reducer are used on the transmission. The fluid coupling makes the transmission smooth and provides overload protection; the hardened gear reducer has high transmission efficiency, long service life and compact structure.